With online dating now the second most popular way for singles to meet, it’s surprising that many couples still feel embarrassed to openly share with friends and family that they met online. 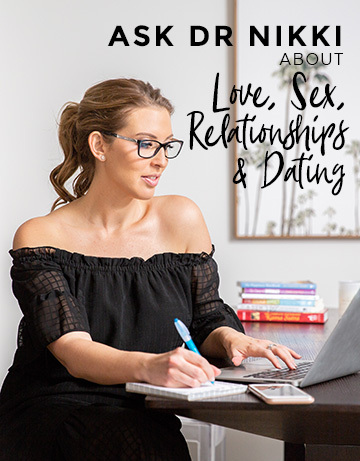 Sexologist and Relationship Expert Dr Nikki Goldstein explores the myths behind the stigma, and shows that finding love online is in fact something to be celebrated, not ashamed of! Raise your hand if you have ever dated online? Internet dating is now the norm, with over 2.8 million users on eHarmony Australia and online being the second most popular way for singles to meet each other after meeting through friends. Once it seemed reserved for the shy and ‘desperate’ but nowadays most people have dabbled one way or another in the quest to find love using the net. In order to take away the negative stigmas, let’s first bust some myths of online dating! We are brought up to think that prince charming or a princess will one day just appear. We are never really introduced to the concept of working for love or taking measures to find it. Hollywood has also taught us that we might just bump into that person in the street and that it was simply ‘meant to be’. So it’s no surprise that when we jump online and meet someone it might feel as though we never got a fairytale story. Let’s take our heads out of the clouds for a moment and look at this more realistically. The idea of this fairytale encounter (which still might happen for some) is based mostly on fictional stories. Shouldn’t the fantasy be the life that you create with someone you are compatible with no matter how you actually met? Do we actually know what happened after sleeping beauty woke up, or prince charming found the owner of the glass slipper or Richard Gear climbed the fire escape? Did we find out if they ever got stuck in a rut? Or perhaps if once the lust died down, there was nothing left in the relationship? Growing up, many women are taught that a man should ask them out and they shouldn’t be too forward. Flirting is ok, however over-flirting might make someone look desperate. So if you decide to take to online and put yourself out there, what does that mean? You haven’t been attractive enough for someone to approach you on the street or in a bar? For a guy does that mean all your advances have been rejected? Hardly. Has anyone noticed these days that thanks to technology, conversations with strangers seem to be rare and men asking woman out in the flesh is nearly a dying art? Even women talking to men doesn’t seem to happen that often. We all have our heads down in our phones and we are sometimes not even aware of what is going on or who is around us. We might also want to consider why someone might not ask someone out. Are they scared of rejection or unsure if the person is even single? Enter online dating. What message does it send when you have a profile online? Not that you are not attractive enough but that you are simply available for a chat (and maybe a little more…). There seems to be this attitude that if you are spotted online then you are desperate for a serious relationship. Aren’t we supposed to have that carefree, relaxed attitude of “if it comes along…?” How many people tell you they are lonely or they would like to find someone but are not doing anything to find them? Online dating is just the new virtual version of a bar, but now we can see who is actually single. Love, intimacy and companionship are basic human needs and at some level we all desire them, so why be ashamed in taking steps to finding someone you can experience this with? You should be proud that you did something to find love instead of sitting on the couch waiting for it to fall into your lap. It’s far worse to be the person who complains about a lack of love but is doing nothing to change the situation. The reality of it is, the person you are nervous about telling the truth too is probably still online but just not having as much luck as you. If you met someone online or at least having some fun dating, scream it from the roof-tops. Let others out there know that these days you can find some really great people online.